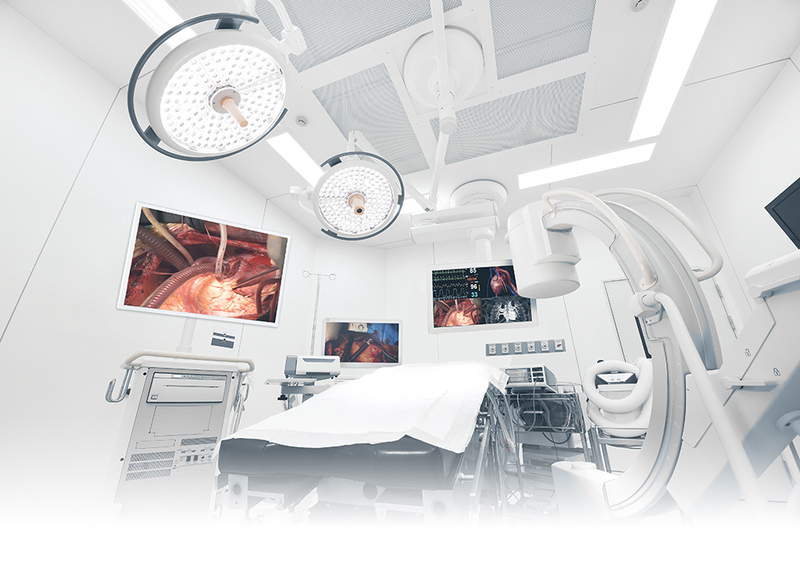 Taipei, Taiwan, June 1, 2018 -Advantech, a leading provider of medical computing platforms and solutions, is pleased to announce the Advantech Kostec PAX-324 24-inch widescreen medical-grade surgical monitor, for medical applications to ensure operating precision. Designed to deliver medical images of optimal quality, the PAX-324 monitor supports a Full HD resolution of 1920x1200 @ 60 Hz. Equipped with DICOM Part 14 GSDF compliance 14-bit LUT processing grayscale, hardware calibration support, and automatic charge input detection, the PAX-324 surgical monitor ensures precise representation of grayscale images. Meanwhile, power-saving features automatically switch the screen in to standby mode after 3 seconds without signal. With the inclusion of backlight leveling technology (BLT), the PAX-324 monitor maintains brightness at the pre calibrated maximum luminance level (L’max), and consistently matches the just noticeable difference (JND); thereby reducing backlight warm-up time and extending the product lifetime. To facilitate simultaneous monitoring of color and monochrome images on the same screen, particularly for operating room (OR) applications, the monitor also features hybrid gamma encoding (HGE) technology. The PAX-324’s slim true-flat design also offers physical onscreen display (OSD) keys, a splash screen and an optional touchscreen with projective capacitive control, and can be upgraded into an IP-based monitor. The PAX-324 is a true-flat, full HD surgical monitor with AR filter. Boasting a narrow edge of less than 24 mm, panel, thickness of less than 20 mm, and weight of 7.20 ~ 7.85 kg (15.87 ~ 17.30 lb), the monitor offers a compact and lightweight imaging solution for medical applications. In addition to displaying images with various aspect ratios without distortion, the monitor features contains a higher pixel density that enhances image sharpness, while the increase in vertical space offers a 10% greater viewing area. The I/O cover design optimizes cable routing and enhances hygiene for superior infection control. To eliminate heating issues, PAX-324 is also equipped with an IPX1 ventilation hole that boosts airflow. Finally, the silver decorated rim provides a luxurious, elegant appearance, while the physical OSD keys are designed to be downward facing to prevent accidental touch. The PAX-324 monitor features a variety of analog and digital I/O interfaces for optimal connectivity in order to display images from diverse image sources. Moreover, the PAX-324 surgical monitor is equipped with HGE technology for dual-modality support, allowing color and monochrome images to be displayed on the same screen, without sacrifices in image quality. This functionality is extremely important for imaging applications in OR environments.